LX900 is Primera’s newest, fastest and most economical to operate color label printer. It utilizes the latest in high-resolution inkjet technology to print brilliant, colorful labels for your products, boxes and packaging. Individual ink cartridges for each color let you replace only the colors that need replacing. You'll save time and money on every job you print. Printed labels can include photos, graphics, illustrations and text – even high-resolution linear or two-dimensional bar codes. This all-new printing technology delivers razor-sharp text, graphics and the most photo-realistic printing possible. Print labels when and where you need them in just the quantities you can actually use. 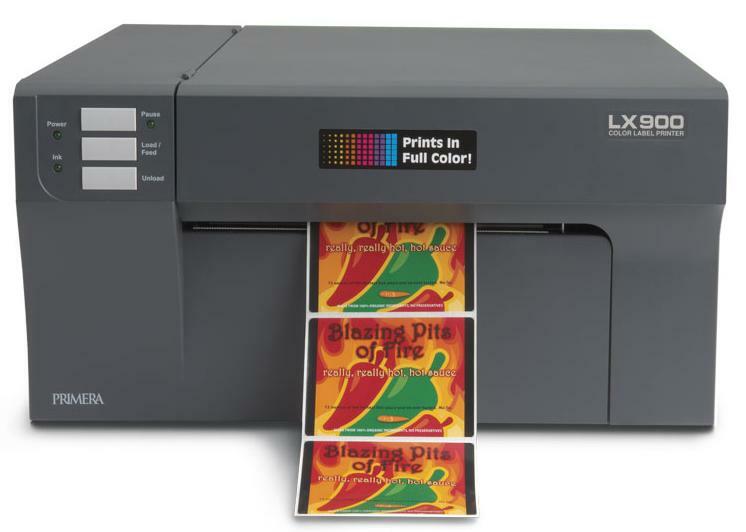 With LX900, you’ll produce full-color labels at up to 4.5” per second in draft mode. Short runs are printed fast and efficiently, helping you to increase the production of your products. You can even operate several LX900 printers from one PC as your production volumes grow. Whether you print just a few labels at a time or thousands, they’ll be printed at speeds you probably never before thought was possible from a desktop label printer. LX900 Thermal Inkjet 8.25" 1.5" - 8.375" 4800 6" 3"